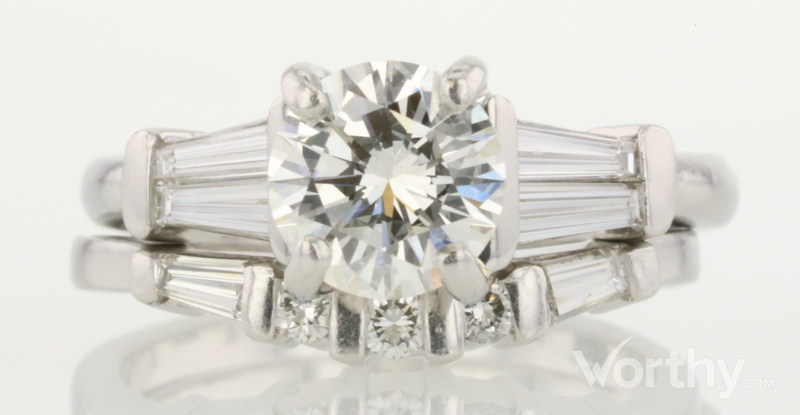 platinum custom made bridal set ring consisting of round shape, natural diamond, weighing 1.20 - 1.23 carats, having a K color and VS2 clarity, according to GIA grading scale. The center stone measuring 6.91mm x 6.94mm x 4.29mm. All surrounding diamonds are genuine with a total carat weight (cttw) of 0.83 carats. Chip Description: Minor chips in the culet. Inclusion Description: The grade making inclusions are: a faint cloud located in the pavilion near the culet that reflects into additional facets, a very small feather cluster/deep bruise located in the crown along a facet junctions outside of the table, and a line of tiny crystals that are surface reaching in the table.